We “Mechmatics Engineering Private Limited” engaged in manufacturing and trading an excellent quality range of Fluid Power Engineering Equipment, Dynamics of Machine, Fluid Mechanics Laboratory Equipment, Heat and Mass Transfer, Kinematics of Machine and much more. We at Mechmatics believe that good education helps to transform the world into a better place to live. Knowledge is cultivated when tools used in the learning process are of finest quality, clears the fundamentals and initiates further thinking. Albert Einstein once said, "The Only source of knowledge is Experience". Our products are designed to impart this experimental knowledge. Founders of Mechmatics are a team of Engineers with a cumulative experience of more than one decade. They all believe that, "By Work one knows the Workmen". So we let our products and services speak for us. To provide solutions to advanced range of equipment in the field of surgery, pain management and advanced technical driven solution for neonatal and pediatric care . Our Aim is to be Recognized as a Leading Medical company and delivering world class product by adopting the latest globally accepted technologies. 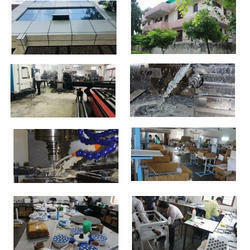 We are also committed for quick after sales support for our products. As a research base company, our team is continuously engaged in development of new products as well as up-gradations in our existing product range. We are dedicated to achieve new heights in engineering designs with high degree of clinical precision, keeping the safety of patient and supporting staff on top priority. We have the developing R & D setup equipped with advance range of Test and Measuring instruments for achievement of best quality and reliability in our products. Our Administration office is located at Electronic City NOIDA, Gautam Budh Nagar, and Factory Premises at Udhyog Kendra-II, Greater Noida.